Okay so once upon a time (last year) I started reading a book called Consequences by Aleatha Romig. And it was right up my alley. Dark, kidnapping, Stolkholm syndrome-y, the works. ‘Cept… I got to 30-something percent and I panicked. Especially after hearing that there was a part I was coming up to that was realllllly “eeeeeeeeeep-worthy” and would make me hate him even more than I already did. I didn’t want to know, and I put my book in the freezer. Well. No ’cause it’s on my iPad, and it woulda broke, but you know… 😉 I ran away from it, scrolled it down my TBR list (but kept it on there) and moved onto “lighter” reads. It sat there, taunting me to pick it back up. My fellow readers continued reading without me, and there was a reader-frenzy!! So many of you LOVED it (while simultaneously hating… it. Stuff. Parts. Him? Definitely hated him). But you encouraged me to continue. Actually more like taunted me. Just like the book, and it’s mysterious eerie cover and strange hold on me… taunting and tempting me to finish it. Julie: Maryse, did you read Consequences yet? Maryse’s Book Blog: I wasn’t ready you guys. I just. Wasn’t. Ready. Emma: Hey chicken-little… it’s OK, you’ll get around to reading them one day. I think the third book is going to be awesome. The twisty, emotional havoc wreaked; is just too much fun. I am not usually a mystery thriller type reader, but this story is good and it makes me MAD and anxious and all trembly. Maryse’s Book Blog: Consequences is still holding at 30 something percent (whatever spot that is right before it’s gonna get bad). I stopped, and started clucking. LOL! Sandra: … I wanted to murder Tony in Consequences!!! Then with Aleatha’s magical skillz I am now Team Tony (after reading Truth). I am in awe of how she pulled that one off. Paula: I hated Tony at the end of Consequences. Now I’m in love with him after Truth. Aleatha is brilliant!! Gladys: I agree with Sandra. Truth changed everything for me. Team Tony all the way! Maryse’s Book Blog: I wanna say you guys are CRAZY!!! but at the same time, I’m very excited to find out how you could possibly think this… Unless Tony is a twin or something, and one is evil and one is sweet. Okay maybe then… I can see it. *shakes head*. Kirsten: LMAO. Tony is just… *sigh* I hate to admit this but I mostly liked Tony after Consequences. I was in utter shock at the end but still I couldn’t help myself. By the end of Truth I was crushing HARD. Rebecca: I don’t think Tony really redeemed himself to me until Truth. But it was worth it. Michele: Now, that is how I was with Caleb. I LOVED him the whole time.. but Tony.. I don’t like him! I haven’t got to Truth yet.. He made me SO MAD I had to quit and take a break after Consequences!! lol. Don’t let them fool you Maryse!!! I STILL HATE HIM!! JUST WAIT!! You will too! tee hee. Maryse’s Book Blog: LOL!! I’m all… “What the….?? ?” at these “I love Tony” reactions! You ‘n me, Michele!! Or, will our fellow readers be laughing at us soon? Ruh Roh. What if we end up joining the “I Love Tony” errr… “fan club”, too? I know… who am I to talk? I had a love/hate relationship with Caleb from the Dark Duet, so you know, I get you. I think. Well, let’s just say right now, where I’m at in Consequences, y’all are off you rockers to put “love” and “Tony” in the same sentence. But I can’t wait to find out what happens, and what changes, and how the author tricks us er… I mean… I mean shows us that Tony is lovable. Ok off I go to finish Consequences, ’cause I’m DYING to know what happens to all of your brains in Truth. I mean… come on!! How can..? Er.. I mean? WHAT!??? For real? Come onnnnnn! Seriooooousslyyyy? Love Tony? Okay. O.K. Well no matter what I think of Tony right now, I can say I love the book. The thrill, the fear-factor, the appalling moments (well… I don’t love those but again, I don’t like monsters under my bed either, but I sure love reading about ’em). I’m in and there ain’t no stopping me now! So glad you’re reviewing this one Maryse! I’ve heard so many horrible crazy things about this book, but then there are equally good reviews for it. I’ve been just as hesitant as you to read it! If you like it, I’ll be more inclined to give it a chance! I loved Consequences! You really do have to stick with it because it is soooo worth it in the end. Sometimes I wanted to quit bc I didn’t know where it was going. Then BAM! Shocker! I started Truth immediately but I stopped at 46% bc I needed something lighter. I was screaming at my Kindle and I wanted to throw it across the room. I was an absolute mess. I’m planning on starting it back next week. I love it when I find a book or a series that makes me so emotional. heheh. At least I’m not reading it alone… eeeeeep!! Oh Maryse you’re making me laugh. I remember those bok bok messages. Umm.. I know I shouldn’t but I do love Tony. I get him. I don’t always agree with what he does, but I get it. It took me much time on our therapy/spoiler thread 😉 here to be okay with my love for him, but I’ve accepted it. Regardless of how you feel about Tony, love or hate him, we all agree that the twists and turns in this story are awesome, and the writing is wonderful. 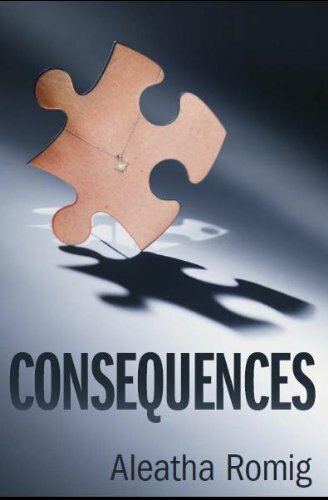 I was sure after reading Consequences that Truth would in some way not live up to my expectations… WRONG. Even though I didn’t think it was possible it’s even better. I’m kinda jealous I’m not experiencing this for the first time again. Yea Maryse!! I’m so glad you have picked this back up. Consequences and Truth are two of my favorite books ever. The way Aleatha was able to twist and turn events and characters in this book kept me captivated. The writing is brilliant and everything you “think” you know gets twisted and you find out you don’t “know anything at all. These books have remained with me MONTH’S later and I still find myself trying to figure things out. I’m anxious to read your thoughts and review on these books when you get done. Loved loved loved these 2 books Maryse! I agree with you, in the first book I wanted to strangle Tony, he was just a monster but when I finished Truth I couldn’t believe how my opinion changed I actually really really liked him. That is brilliant writing! I can’t wait until you get to book 2 please let us know if you have joined us crazies :). I am so in love with these books! I’ll admit Consequences was hard to finish. I couldn’t believe the ending, I was WTF?!! But, as soon as finished I couldn’t wait to get my hands on Truth! Do I love Tony now? Do I ever!!! I am dying for Convicted!! Fantastic book series! The jury is still out for me on loving Tony, but I’m coming around. Could not put these books down! Love love love this blog and am now convinced to start consequences…ugh I will be there with you! You guys are making me anxious (in a good way), like walking into a haunted house at a carnival (kind of spooked). I really need to start this ASAP!! With what you just posted about the second book –>everyone’s on Team Tony!! I love when authors can screw with your emotions!! I am very sorry to say but I am still with Team Tony Haters…..Both books are amazing and I can wait for Convicted!!!! Just enjoy the punch to the face that is the end of this book and be very thankful that you have the awesomeness of Truth that is awaiting you. The waiting for it to come out was sheer torture! For those who read Access All Areas, the sequal is out now! Acess Restricted. Reading that tonight! Anyone know when the third part is going to be released ? This book, I tell you is one crazy ride and then you get to the second book and start to question everything you think you know. Tony is a crazy character that made me constantly question my ability to tell right from wrong, especially in book #2. How I felt about Tony was pretty clear after book #1 and book #2 threw me into a tailspin. It is not often that a book does this to me and shows the true talent of the writer. Those books have some amazing writing in it. Book #3, I’m hoping will be the book that helps me figure out once and for all the true Tony. One of my favorite trilogies EVER! Suspenseful, maddening (I really hated the author, like over & over & over… you get the picture), and then all of a sudden, sweet and heartfelt. Very well written and a surprise at every turn of the page. I felt like I was on a scavenger hunt through all three books.